Our Amish craftsmen are part of a tradition that has been raising and caring for horses for decades. Who better to build your Horse Barn, then men who work with, depend on, and understand the needs of horses on a daily basis! Not only will your Horse Barn look great, but it will be designed and built to meet your personal needs and, perhaps most important, the needs of your horses. 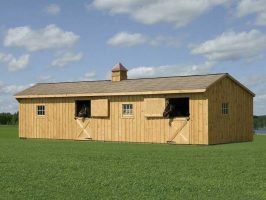 You can customize your horse barn to create virtually any layout, combining run-ins, tack rooms, and enclosed horse stalls. Shed Row Barn (as seen left). If you’re shopping for a quality horse barn at a great price, you’re in the right place. 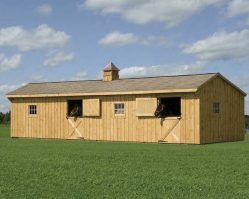 We offer a huge range of horse barn models and options for every horse owners needs. Every barn we have is made by Amish craftsmen who have mastered the art of barn building. Take a look at the choices you have below, the options you have to choose from, and give us a call if you have any questions or want something you don’t see on our list. Chances are we have it, or can build it for you. Open floor except tack rooms. Tack room floors include 2×6 pressure treated joists, 16” on center, and 5/8” underlayment on top of floor joist.